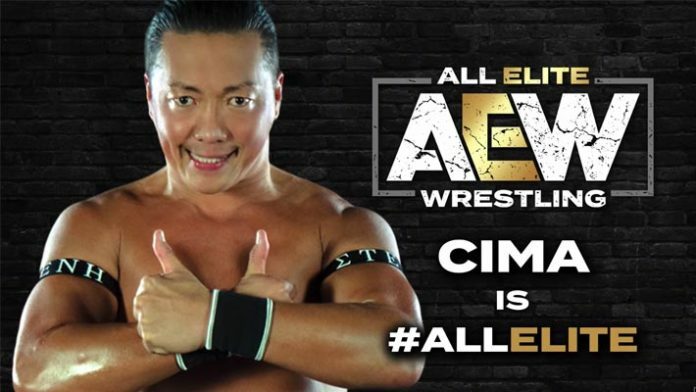 AEW officially announces that they have signed former Dragon Gate star CIMA to a contract after being announced for Double Or Nothing. We have even more All Elite Wrestling (AEW) news to pass along. The Khan Family-backed promotion is rumored to have secured a broadcast television deal with a major network. Teh report suggests AEW TV is said to begin airing in October. Now, a new signing has been made official for the AEW roster. The announcement came during the latest episode of ‘Being The Elite.’ The Young Bucks announced that AEW has signed CIMA to a contract. Matt and Nick explained that CIMA got The Bucks booked on a Dragon Gate tour several years ago, and even wrestled some tag team matches with them for the promotion. Former pro skateboarder Darby Allin also appeared in the episode, who was announced to be joining AEW last week. It’s likely he will be part of AEW’s ‘Double Or Nothing’ card, however, his first advertised match for the promotion isn’t scheduled for a month later.